A perfect piece for a coastal cottage, this stool takes its cues from the high seas. Rustic, sailing-inspired rope winds around the sturdy iron frame. 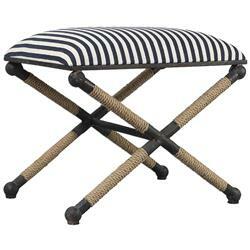 Nautical and nice, navy blue and white stripes pattern the cushioned seat. This accent has classic, enduring style.